David Davis had spent over 35 years in retail working his way up the corporate ladder from being a stocker to regional director of operations before he bought his Filta franchise in January 2016. He first explored franchising after a friend suggested he should start his own business whilst he found himself in between jobs in 2010. David knew he was looking for something different and when he came across the Filta website he decided he was going to travel to Orlando and attend the discovery day. However, on returning David was unsure about the selling part of the business and went back to his comfort zone of working within the retail environment for a further 5 years before moving back home to Memphis to be with his family. “In 2015 I moved back to the Memphis, TN area to be with my kids and grand-kids and I still felt like I was looking for something different to do. Even though this was 5 years later I was still subscribed to the Filta emails and in August 2015 I received one from Barbara McManama who I had met at the discovery day in 2010 and it persuaded me to reach out” said David Davis. “I prayed about this opportunity for two or three months before God led me to say it’s the right time to do something else. I went back and did the discovery day and I really liked what I saw and learned even more than my first visit. I talked to my wife about it and how this could get me out of retail and fortunately with a bit of help from Filta and some stocks that I had I was able to cover the start up costs” said David. David is fortunate enough to have a great team behind him including his son Adam who is VP of Operations and mechanically inclined and helps work on the machines. 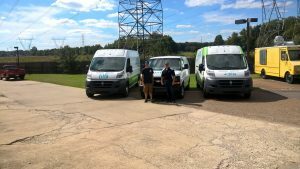 To date, David has three technicians running three separate vans across his Tennessee territory and has picked up some big accounts along the way. This has allowed him to reach his personal 3-year goal by the end of his 2nd year. David also thanks Filta for the support they have provided, particularly Towanda Taylor of the inside sales team. “Towanda Taylor has really made my life a lot easier, I send her some leads and she then makes the initial call to find the decision maker and get my foot in the door. I then follow up with a call later speaking directly to the decision maker and set up the appointment myself. One of the main reasons why my business has grown to what it is today is because of Towanda” said David. David ends by adding “for anyone starting out, from a cost point, this is one of the cheapest franchises I’ve seen and its unique, with no real competition. You’ve got to be willing to work, particularly for the first 18 months getting your hands dirty and providing the service, but that allows you to understand the service better and means you can still jump in whenever your needed”.